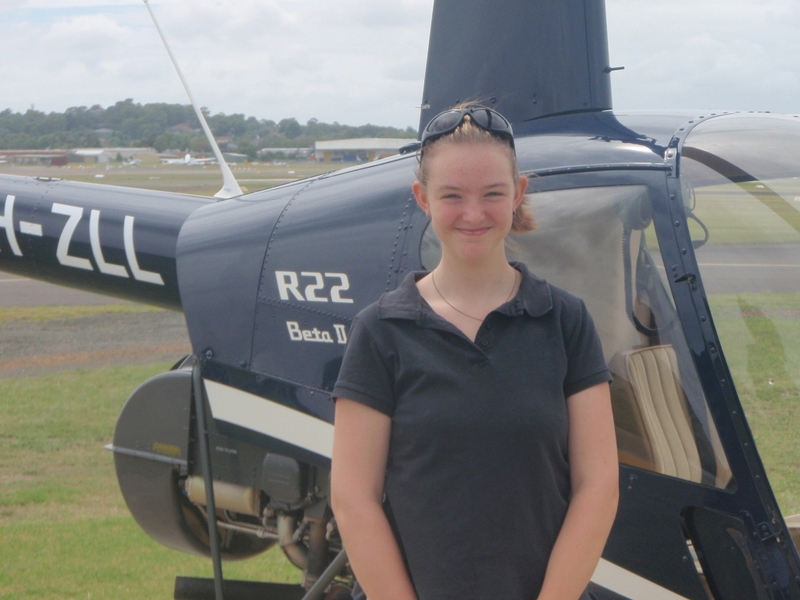 My name is Megan Aylward and I am a cadet in NSW Girls Group of the Australian Air League. Recently I had the chance to have my first helicopter flying lesson, a trial instructional flight in a Robinson R-22 helicopter from Bankstown Airport. When we arrived at Bankstown, the first thing my instructor showed me was how a helicopter works and how to use the flight instruments. Then after a briefing where he explained where we would be flying and what we were going to do, my instructor and I sat in the helicopter waiting for permission to take off. My instructor demonstrated how to turn the helicopter using the cyclic, how to stay straight (in line with the horizon) and tried to teach me how to hover. Hovering is very difficult and will probably take a while to learn. Did you know that helicopters can also fly backwards? Well they can and it is very exciting! During the 30 minutes I had I learnt a lot about how to fly a helicopter. It is a very exciting experience and everyone can do it if you put your mind to it. I hope to learn to fly helicopters with the Army when I finish school. Do you have a story to tell? Contact us at webmaster@airleague.com.au and you could get published too!